Tonight we are going to review a wine blend made of cabernet sauvignon, merlot, cabernet franc and pinot noir, where the first three are classic Bordeaux grape varieties, that form the main body and structure, while the last one is the key of this blend, as it is meant to add those velvety-leathery notes, which are sought after by the consumer. 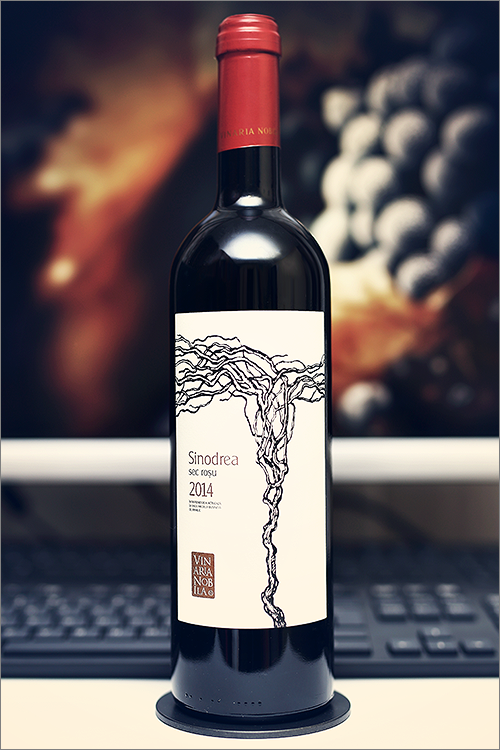 The wine we’ve selected for the review tonight is Sinodrea 2014 from Vinaria Nobila. This is one of the flagship wines from Vinaria Nobila and it has been aged for 24 months in new oak barrels, which is quite a lot, but let’s not put too much emphasis into the theory. Without further ado, let’s move on to the tasting! Noble ruby color, not too deep and a bit pale, with hazy copper hues towards the rim of the glass. The nose is strong, filled mostly with black fruits and spice: overripe sour cherry, ripe red plum, cranberry, dried black cherry, blackberry, dried cherry tomato, blackcurrant, cranberry jam, red mulberry, black cherry jam and black raspberry jam. An instant later the nose is filled with elegant notes of roasted oakwood, red and black pepper, nutmeg, red paprika, smoked plum, charred wood and some subtle meaty-irony hints. The wine is extra-dry, with high alcohol level, high acidity and firm tannin. It feels spicy, crisp and bold, with a quite fruity accent and a warm alcoholic finale. This is a quite woody, seedy and quite muscular wine, as it tastes tannic and austere. The wine has a fair overall balance, yet the wood clearly dominates over the fruit, as a result the wine feels extracted, a bit tart and sharp despite its elegance and complexity. It has a long finish and an balanced, tart and seedy aftertaste. This is definitely a great Wine of Moldova and the overall rating says the same, with 90.9 points scored it is right there, among the best wines we’ve tasted so far. Please click on the chart icon on the left in order to get to the wine rating page, where you can find all the wines we’ve tasted to date. Conclusion: this is a wine that is too young to drink now, a bit off balance, as its tartness, sharpness and angularity has yet to settle down. We recommend a couple more years of bottle ageing (2 to 3 years at least), so that the wine will get closer to its prime form. Despite its youthfulness, the wine has plenty of tannic grip on the palate and a quite dense and rich palate, which is a mix of power and finesse. We would recommend to pair this wine with meaty dishes rich in umami and spice flavours, like for example a roasted beef tenderloin with mushrooms and white wine cream sauce or a pan-seared filet mignon with red wine reduction sauce, so that all the angularity in the wine will be perfectly complemented by the spiciness and meatiness of the dish. Enjoy!